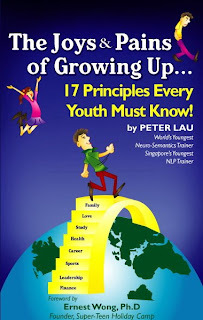 Peter Lau's Blog: Get your copy of "The Joys & Pains of Growing Up: 17 Principles Every Youth Must Know!" Get your copy of "The Joys & Pains of Growing Up: 17 Principles Every Youth Must Know!" Hi everyone, I am pleased to announce the completion of my book: The Joys & Pains of Growing Up: 17 Principles Every Youth Must Know! This is the book that I started writing when I was 16 years old and finally, after 7-8 years, it is completed. I felt as if I was pregnant for 7-8 years and then finally giving birth to a baby. Now, this book is my baby! This book is based on my life and in it, I share the lessons and principles I've learned over the years that I believe every youth must know! The whole writing and publishing process brought me many joys and pains. In the end, it was all worth it! Here, I would like to particularly thank Dr Ernest Wong for first believing in me and guiding me through the whole process even though it was a painful process. I would also like to thank the team of extraordinary people whom I have the good fortune of working with. Namely, Auntie Theresa, Ken and Gabriel. Thank you guys for making me a better person! Note that the Training Center may not be open everyday but it will be open on most weekends from 1:30 to 5:30pm. Please help me spread the good news to your friends! Thank you for your support! Go get this book Now and your LIFE WILL NEVER, EEEEEEEE................EEEE..................EEVER, BE THE SAME AGAIN!! !